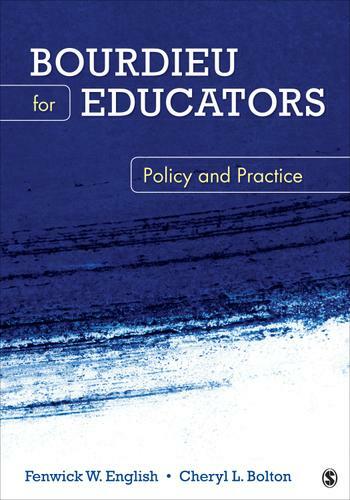 Bourdieu for Educators: Policy and Practice, brings the revolutionary research and thinking of Pierre Bourdieu (1930[en]2002) of France to public educational leaders in North America, Canada, Australia, and the U.K. This text brings Bourdieu’s corpus into the arena of elementary and secondary educational reform and change, and offers policy, research, and practice discussions. Authors Fenwick W. English and Cheryl L. Bolton use Bourdieu to challenge the standards movement in different countries, the current vision of effective management, and the open market notion connecting pay to performance. The text shows that connecting pay to performance won’t improve education for the poorest group of school students in the U.S., Canada, or the U.K., regardless of how much money is spent trying to erase the achievement gap. The authors layout the bold educational agenda of Pierre Bourdieu by demonstrating that educational preparation must take into account larger socioeconomic-political realities in order for educational change and reform to make an impact.